In Switzerland, too, there is growing dissatisfaction with unfettered immigration — in this case the entirely legal kid — as Alain Salles reports in Le Monde on an initiative to hold a nation-wide referendum on Sunday, February 9, whether to install quotas on immigration. Among the problems are 80,000 more immigrants each year (instead of the promised 8,000), a rise in crime, overflowing trains, traffic jams, problems with finding a parking space, trouble finding a home, and the rise of rent prices. Referring to William Tell's most famous feat, the pro-restriction forces' poster features an apple tree that has grown so much that its roots are strangling the country, while the opposition accuses the former of cutting down the apple tree of Swiss prosperity (see photo). Switzerland's immigrant problem is different from America's and has to do with neighboring countries' nationals, no paupers they or most of them (French, Germans, Italians, etc), crossing the border to work and/or live there. Nevertheless, it's eye-opening (at least, it should be to leftists, of whatever nationality) that the 2002 agreement with the European Union did not bring a "(re)solution" but seems to have, in the eyes of many, made the problem (a problem) worse or created problems of its own. In other words, and from an American perspective, the leftists' promise that amnesty — or any other high-falutin' plan of theirs — will "repair" or solve a problem in need of "reform" and make things better is to be taken, to say the least, with a grain of salt. Une victoire du « oui » devient donc possible. Les autres partis, de droite et de gauche, se sont mobilisés, tout comme les milieux économiques, pour dénoncer l'argumentaire de l'UDC, mais le parti de Christoph Blocher est au centre du débat. Ce chef d'entreprise et homme politique controversé est le symbole de tous les combats contre l'Europe en Suisse. Il redoute toujours une « adhésion à l'UE à pattes de velours ». « Nous ne voulons pas fermer nos frontières, mais nous voulons les contrôler », affirme Claude-Alain Voiblet, vice-président de l'UDC. « Lorsque nous avons signé les accords de libre circulation, on nous avait prédit une immigration de 8 000 personnes par an. Nous sommes à 80 000 par an. Dans le même temps, le nombre de frontaliers qui travaillent en Suisse a presque triplé en dix ans, avec près de 280 000 personnes, sans compter 250 000 sans-papiers et 700 000 étrangers naturalisés. On ne peut pas continuer comme ça », assure cet élu de Lausanne. Ils sont nombreux à se plaindre des trains bondés, des embouteillages au milieu des villages situés sur la route entre la France et Lausanne. L'arrivée de ces travailleurs, dans un pays qui répugne à construire des tours, a entraîné des hausses de loyers dans la plupart des villes. Megabytes: What Do the Letters NSA Stand For, Barack Obama? • Little Girl: What does NSA mean? 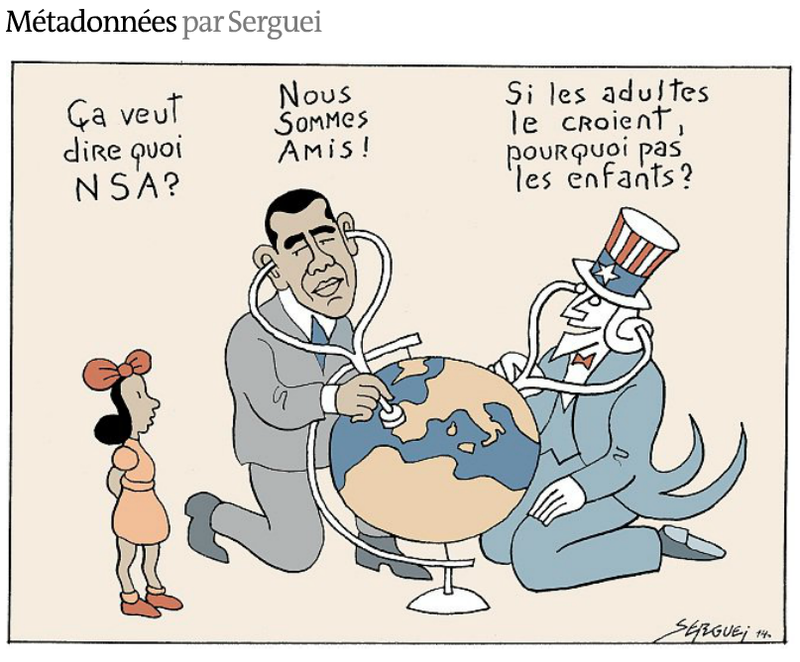 • Barack Obama: We Are Friends [Nous Sommes Amis] ! • Uncle Sam: If grown-ups will believe that, why wouldn't kids do so as well?! The French foreign ministry's national archive section has made available documents between France and the United States from 1976 to 1981, spanning the Jimmy Carter era to the beginning of the Ronald Regan White House (obrigado para OT). None Other Than MLK Welcomed Judgment, So Why the #$#%$@# Should We NOT Judge Wendy Davis?! Judging is what voters do every time they step into the voting booth. It’s part of being an elected official and there’s nothing wrong with that. Here’s how I would judge Wendy Davis. She’s a flaming liberal whose main claim to fame is that she filibustered a common sense abortion bill that would have restricted abortion after the twentieth week, required abortionists to have admitting privileges at a local hospital, and required abortions to be performed in surgical facilities. The bill she objected to so fervently was a reaction to the Kermit Gosnell scandal, in which a licensed “doctor” who specialized in late term abortions, murdered children born alive and maintained a filth-ridden and dangerous facility. Also, her biography as single mom who worked her way through Harvard is a horrendous lie. She found a wealthy husband to pay her way and take care of the kids for part of her college career, then divorced him when her student debt was paid. In other words, she’s wrong on the issues and her whole life is a sham. Why the heck shouldn’t I judge her on exactly those criteria? Judging people by the content of their character is fine and should be encouraged. The content of Wendy Davis’s character leaves something to be desired, particularly her bloodthirsty passion for gruesome late term abortions. And that is why we aren’t allowed to judge her. It isn’t as if liberals don’t judge. Liberals pass (negative) judgments on home-schoolers, FOX News viewers, smokers, global warming “deniers”, and evangelical Christians. They pass judgment on a diverse cast of “bigots,” real or imagined, and publicly shame them in hopes of reforming them. Liberals even judge people for being judgmental! So it isn’t judging that perturbs them so much; it’s other people judging according to criteria that liberals don’t like. Generally speaking they don’t like people to judge sexual habits, which somehow includes abortion as well. Abortion is violence but in their minds it’s a “bedroom issue.” Also, they don’t like others to judge them for drug use. Everything else, as far as I can tell, is fair game. Liberals have become quite adept at twisting the words of Jesus to condemn those who judge. They like to forget that Jesus commanded, “Stop judging by appearance, but judge justly” (John 7:24). One story they prefer is the story of Jesus saving the adulteress from stoning. Jesus wasn’t of course condoning adultery, but raising his voice in opposition to a barbaric execution. Liberals always forget Jesus’s parting words for the adulteress: “Go and from now on sin no more” (John 8:11). You’ll never hear a liberal tell you that Jesus instructed his followers to rebuke sinners (Luke 17:3). And no, it isn’t true that Jesus had prostitutes and tax collectors among his inner circle; he had ex-prostitutes and ex-tax collectors. Another Bible verse liberals keep in their back pocket is Jesus’s saying on removing the log from one’s own eye. Again, they leave off the final clause: “[T]hen you will see clearly to remove the speck from your brother’s eye” (Matthew 7:5). Jesus wasn’t admonishing us not to rebuke our brother when he has done wrong. He was reminding us not to rebuke hypocritically for something of which we are also guilty. Once we have removed the log from our own eye we can and should to judge our brother with clear vision. But liberals aren’t fooling anyone when they quote hypocritically from that Jesus guy. They have no use for him. To liberals he’s nothing more than a fairy tale wise man, something like Merlin or Ben Kenobi, whose words can be quote-mined for the purpose of using against his followers. Judgment alone is no sin and no crime. It would be foolish to judge Wendy Davis, or anyone else for that matter, by some superficial standard. But it would be even more foolish not to judge her at all. She’s a politician, for crying out loud, and we’re voters. If we aren’t allowed to pass judgment on our elected officials, whom may we judge? We reserve the right to judge her ‘til the cows come home. If she fails the test of the voters’ judgment this coming November, as she probably will, she’ll have no one but herself to blame.